The meeting was attended by Mr. Eduard Biriucov, the Secretary General of the PS IGC TRACECA, Mr. Akif Mustafayev, National Secretary of the TRACECA in the Republic of Azerbaijan, Experts of the PS, and Representatives of the EU Delegation in the Republic of Azerbaijan. 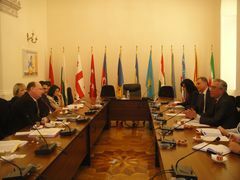 During the discussion was noted problematic of the transport, development of transport infrastructure on corridor Europe – the Caucasus – Asia, as well as changing of views on the current barrier, issues of transportation of goods and the further expansion of transport along the TRACECA Corridor. 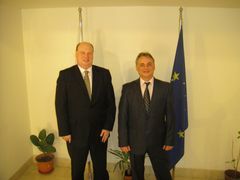 Mr. Biriucov informed Mr. Hololei on current problems of the TRACECA, particularly the results of the First Investment Forum, the future work of the IDEA Project experts in the countries with the prioritized projects that were presented at the First Investment Forum, as well as joint preparation to the Second Investment Forum planned on 2012. Mr. Biriucov expressed his gratitude for EC assistance in the development of the Europe-Caucasus-Asia Corridor, mentioned about the projects, which is implemented up to date. Talking about the perspective dimensions of TRACECA developments for the nearest future, Mr. Biriucov mentioned about the initiative of signing a protocol between the port authorities, rail companies of the countries in order to reduce tariffs for transportation of transit cargo along the corridor, as well as the cooperation with the International Road Transport Union in a series of measures to facilitate border crossing procedures. Mr. Biriucov also informed about the latest developments in the IGC TRACECA, including the expansion of borers, in view of accession of the Islamic Republic of Iran to the Basic Multilateral Agreement in 2009, but due to the UN Security Council sanctions and the EU in 2010, there are difficulties regarding the completeness of this country's participation in various activities of the TRACECA. In response, Mr Hololei noted that he fully shares and supports our interest and efforts in organization of the Investment Forums, stressed the importance of developing alternative routes, including the transportation of hydrocarbon goods. That is why he welcomes the efforts of the Parties to the MLA to optimize the rates for transportation goods and welcomes the interest in solution of the border crossing facilitation. Mr. Hololei stressed the importance of cooperation with the EU, a long-term basis for such cooperation, capable to provide a new role of the IGC TRACECA in the development of alternative routes. Participants of the meeting agreed the necessity for further expansion of contacts with EU and the further actios in TRACECA activities. In this regard, it will be determined EC Experts for joint work with Experts of the PS in the nearest future. 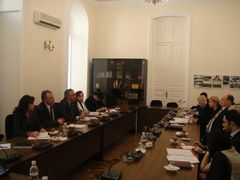 The meeting was held in a spirit of understanding and cooperation.